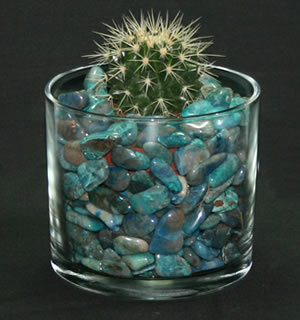 Tumbled stones make an interesting and colorful vase filler that can be matched to your decor or theme. 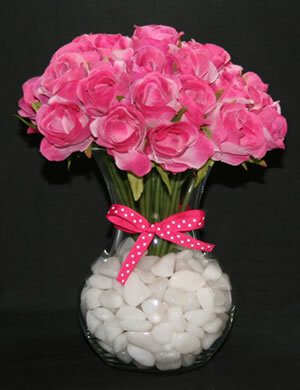 A bouquet of pink roses in a 3.5" x 7" sweetheart vase decorated with a pink ribbon. The gem vase filler is about two pounds of snow white quartz. 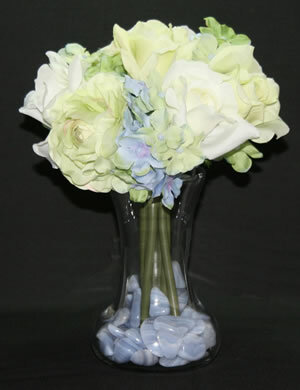 Vase filler is a material placed in the bottom of a vase to support a floral arrangement. It can conceal the stems of your flowers, and weight the bottom of the vase to protect against tipping. 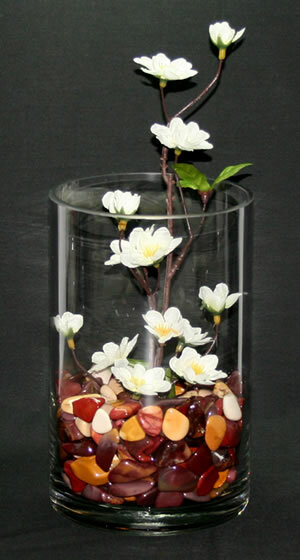 Gemstone vase fillers are very colorful and will make your arrangements unique and interesting. You will be surprised by how many people notice them and the conversations that they will start. Gemstones are enduring. Even though fresh flowers might be temporary the gemstones can be saved, remembered and used in many future projects. Here we share ten of our recent projects. Except where noted, all vase fillers were 3/4" to 1" tumbled gemstones selected from the menu on the right column of this page. In these projects we used artificial flowers and plants so any type of stones could be used. When using live flowers and plants it is best to use stones that will not react with acidic soils and waters. Tumbled stones from the quartz and feldspar families work best. Quartz stones include: agate, jasper, amethyst, citrine, chrysoprase, chalcedony and aventurine. Feldspar stones include: moonstone, unakite, amazonite and labradorite. You can match the vase filler to the color of your flowers. 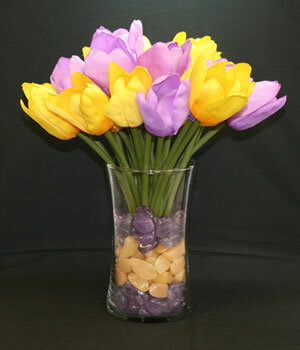 These lavender and yellow tulips are matched by lilac amethyst and yellow quartz in a 4" x 6" gathering vase. About 1/2 pound of yellow quartz and 1 pound of amethyst were used. Keep your cosmetic brushes "at the ready". Select a nice clear container and fill it about three to four inches deep with your favorite tumbled stones (we used golden tiger's eye). The handes of your brushes will easily slip into the smooth tumbled stones and the weight of the stones will hold the brushes upright and ready for use. 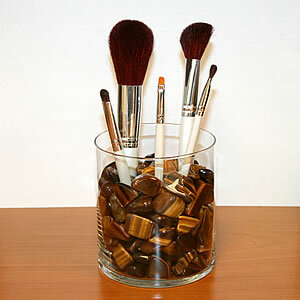 A container of stones can also be used to hold pens, dried flowers or many other items. They look great on your desk or vanity. Vase filler works great with candles! 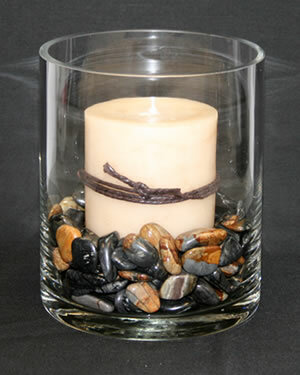 Our cream-color pillar candle is placed in a 5" x 6" cylinder vase and surrounded by about 1 1/2 pounds of black, gray and brown Picasso Stone. 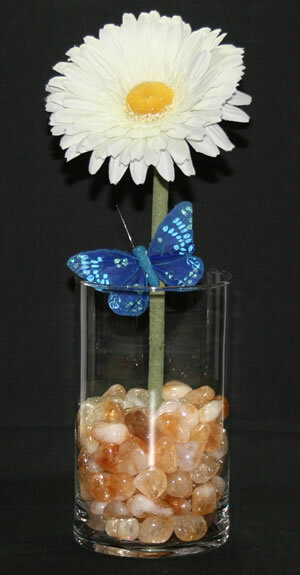 A single Gerber Daisy and a blue butterfly in a 6" cylinder vase with about 1 1/2 pounds of citrine quartz gemstones. 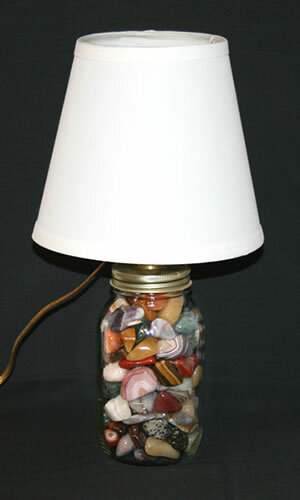 A quart Mason Jar lamp filled with a little over three pounds of large-size Natural Mix. A stem of peach blossoms in a 5" x 8" cylinder vase supported by about 2 pounds of Mookaite. A potted cactus in a 5" x 4 1/2" cylinder vase surrounded by about 1 1/2 pounds of chrysocolla in quartz. A rose and hydrangea bundle in a 5" bud vase supported by about 3/4 pound of blue lace agate. 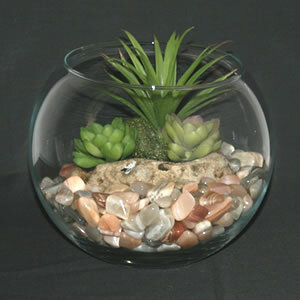 A succulent bowl made by surrounding a pre-made succulent arrangement in an 8" bubble bowl with about 3 pounds of colored moonstone. 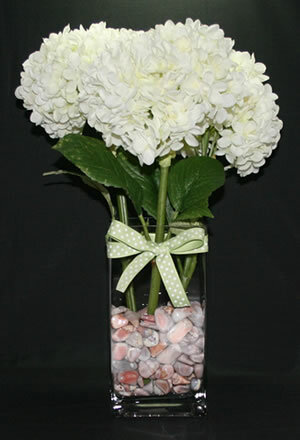 Three large hydrangea stems supported in a 3" x 4" x 8" rectangular vase by about two pounds of pink botswana agate. Choose undyed gemstones in a color that will compliment or emphasize your creation. Most cut and fresh flowers are supported nicely by medium size (3/4" - 1") gemstones. Arrangements with heavier stems work well with large size gemstones (7/8" - 1 1/4"). Add enough gemstones to stabilize your arrangement. This is very important when using flowers with large heavy blooms. Carefully add gemstones to a glass bowl or vase. Dropping them in can crack the vase. Consider combining gemstone colors to accent your arrangement. Select some of your favorite gemstones to face the front of your vase, or to arrange on the top of a potted plant. Undyed gemstones are best when you are using them with fresh flowers in water or on the top of a potted plant where watering occurs. The amount of gemstones added to a vase depends upon how much weight you need to stabilize the piece and your personal preference. To reduce the amount of gemstones required, place a piece of floral foam or other filler in the bottom of a vase and arrange the gemstones around it.